Once ardent supporters of the New Deal’s work relief and welfare programs, American Christians now embrace a bastardized “Libertarianism” that deifies the Free Market while in open contempt of charitable services. While this full about-face would seem to have revealed the capricious nature of “inviolable” beliefs, the theocratic right ardently asserts their tribal Standards of Conduct as immovable, sacrosanct and, in fact, the only rightful beneficiaries of Religious Liberty. Where, one might ask, can we possibly find scriptural support for Hobby Lobby’s purportedly Christian belief that a corporation shalt not pay health care benefits that cover the expense of certain contraceptives? For that matter, where are we to find any justification for the notion of a sacred and immutable tradition that equates providing goods and services to homosexual couples with the Biblically prohibited act of homosexual coupling itself? The court’s have generally determined (mostly when convenient to the interests of the Christian Right, and particularly where the Religious Freedom Restoration Acts are concerned) that such questions of scriptural support and standing traditions are irrelevant — a belief is simply religious if the believer says it is. Apologists, defending theistic religious beliefs, have become adept at shifting the focus of inquiry away from specific superstitions and toward the real world benefits of religious affiliation. Those who debate the apologists often take a stance of anti-religion, rather than anti-superstition, which works entirely to the advantage of the superstitious. When supernaturalism is agreed by both parties to be inextricable from religion, then it naturally follows that the religionist’s cultural identity, values, art, symbols, and practices should all be nullified if superstition is to be discarded. The question shifts from the intellectual tenability of superstition to the social benefits of affiliation. There is no room in this narrative for cultural religious identities held by agnostics, skeptics, and non-believers. Worse, in a legal environment where religions are afforded certain privileges and exemptions, the insistence that religion is defined by supernaturalism advantages superstition over rationalism. I believe that if Dennett were to expand his research beyond traditional established religious institutions he would see that the future of religion is now. Religious Humanism deserves to be considered as a legitimate cultural identity with deeply-held beliefs that go beyond a mere legal ploy to assert equal protection for non-believers. And, despite a lot of ill-informed commentary to the contrary, The Satanic Temple, while openly non-theistic and non-supernaturalist, is entirely sincere in its religious identification. Fighting to re-establish a level playing field for minority beliefs in an encroaching theocracy, The Satanic Temple often fights high-profile legal battles that serve to remind the Religious Right that First Amendment-protected Religious Liberty requires government viewpoint neutrality. 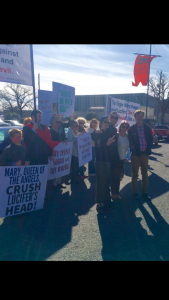 The uproar provoked by The Satanic Temple’s campaigns often cause for a good deal of media attention, while the negative outcome is that many assume the media attention and reaction are The Satanic Temple’s sole reasons for being. Even amongst supportive comments we’ll see remarks like, “The Satanic Temple solely exists to challenge religious privilege,” or, more insultingly, “The Satanic Temple’s sole function is to troll Christians.” The worst, of course, are those who proclaim that because The Satanic Temple does not worship Satan, we’re not “real” Satanists at all. Setting aside the fact that “worship” is antithetical to Satanic anti-authoritarian and freethought values, the act of delegitimizing another’s sense of identity and religious community — denigrating their authenticity because they approach their mythology as a metaphorical cultural narrative — dismissing them for not being fundamentalists, is backward and counterproductive. To ask, as some people do, why we “choose” to “call ourselves” Satanists, if we’re not merely attempting to infuriate Christians is to completely misunderstand almost everything about The Satanic Temple. Non-theistic religious affiliations have cultural attachments that are deeply significant and far from arbitrary. The narrative of the ultimate rebel against tyranny, the attachment to blasphemy as a tool for liberation against imposed, frivolous, sanctified superstitions; the cultivation of the individual will and critical inquiry unencumbered by “faith” or blind subjugation; the willingness to stand as an outsider with a sense of justice independent of laws and institutions; all are embodied by the literary Satan, from Milton to Anatole France, through a canon that speaks to us about who we are and what we strive to be — regardless of what Satan means to those still shackled by superstition or concerned for its preservation and enduring dignity. Satanism, in a certain respect, describes where we “come from” and, as a religious/cultural/philosophical identity, it isn’t subject to rebranding. We have our own affirmative values that are incompatible with theocratic aspirations and unreasoned faith. We don’t exist to “troll” Christians, rather our deeply-held beliefs put us in direct conflict with superstition-based impositions and arbitrary authority. If this is still unconvincing to the religiously unaffiliated non-believer, it makes no difference to us. However, we should hope that any skepticism directed toward The Satanic Temple’s sense of authentic religious attachment will start being carried over and applied equally to our opposition on the theocratic right. For every time we’re referred to as a political activist group that simply “uses” religion to make a point about Church/State separation, we hope that a balanced scrutiny will be applied to the organizations we often find ourselves in conflict with — those that use the label of Christianity to advance an oppressive political agenda. At the very least, we hope non-believers will begin to recognize that in renouncing religion, they are reducing their own civic capacities to the benefit of supernaturalists. With a massive expansion of Government deference toward religious beliefs leering just upon the horizon, it may be time to end objections to religion entirely, and fight instead to ensure that your deeply-held beliefs are recognized with equal standing.